I developed this recipe for Gluten Free Cornbread Dressing because I wanted something that tasted like what my mother used to cook for the holidays. I am a southern girl from Georgia, and in the south, we make our dressing using cornbread. I looked over the ingredients of my Mama’s cornbread dressing, and made gluten free substitutions. This gluten free version is almost as good as Mama’s, and is exactly right for the holidays, or for a Sunday family dinner. Enjoy! Saute´ the onions and celery in the butter until onions are translucent. Meanwhile, prepare the cornbread mix according to the directions on the package. When onions and celery are done, mix them into the cornbread batter. Bake in a 375° oven until browned, about 30 minutes. Let cool completely. I usually make my cornbread the day before. When cornbread is cooled, crumble it up into a large mixing bowl. Tear or cut up the bread into small pieces, add to the bowl. Mix in seasoning, eggs, and broth, a little at a time, until mixture is like a thick batter. You are actually making a savory bread pudding. You don’t want it to be too thin, or too thick. Usually about three cups of broth is enough. Pour dressing into a greased 9″ X 13″ pan or casserole dish. Bake at 400° until set and browned, about 30-45 minutes. Serve with giblet gravy and cranberry sauce. Add 1/2 cup chopped apple and 1/2 cup dried cranberries to the cornbread batter. 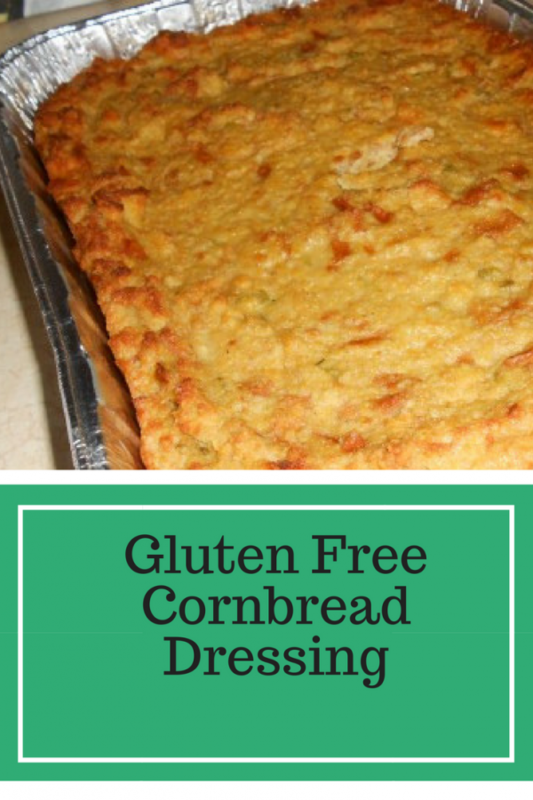 This gluten free cornbread dressing is delicious and almost tastes like my Mother’s gluten full version. Served with giblet gravy, it is heavenly! If you make it, please let me know what you think of it. Now this sounds delicious! I usually make regular old stuffing but I really like the way this sounds, I need to try it! Have anyone actually tried this recipe it sounds great, but I am a black southern girl from Memphis Tennessee and y’all know we get down with the cooking so please let me know how this taste. I have cooked the gluten-free cornbread and it was delicious. I have tried it and I am a southern girl, too. I love this dressing. It tastes like my mother’s. I finally saw some gluten free corn bread mix at our grocery store. They are finally adding more and more. I wish the price would go down though. Thank you for the information. We are going to try this recipe out. This is a wonderful gluten free recipe that I want to try! 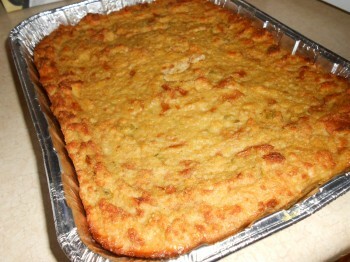 I love cornbread dressing because it is so delicious. I like your recipe and am going to make it soon! That looks very yummy. I’m glad I don’t have to do gluten-free. It’s nice to see a gluten-free recipe for a holiday staple! I’m not gluten-free, but I know people who are & it would be great to make this for them. How many ounces is the package of cornbread mix you use? Pamela’s Gluten Free Cornbread Mix comes in 12 oz packages. That is the only size I have ever seen it in. Cornbread dressing might be my favorite food. It would be nice to offer a gluten free version for family members that need it.